I started using coupons right after Hailey was born. I wasn't "working" but I still wanted to DO something more to contribute. I found coupons, I learned how to use coupons and I applied what I knew and was able to gain a great stockpile of essentials. I am not an EXTREME couponer. I did have quite the tower of TP going but be realistic. You will use toilet paper for years and years so why not get it for FREE? There was a point where you get burned out, but like any habit it's hard to stop. I did have to stop when Hailey got sick. We were able to use what I had on hand and not have to run to the store for little things like deodorant, toothpaste, and shampoo. Well Hailey's been sick for over a year and really needed more attention now then ever. I can't just leave her with a sitter to run to the store to grab something. Josh has a full time job then comes home to help with Hailey. By the time she is asleep at night where we can get things done around the house like dishes or laundry it's already almost midnight and we have to sleep sometime. Even though my stockpile isn't what it used to be, I still have enough to help us get by until I can have a coupon day where I can shop for essentials. 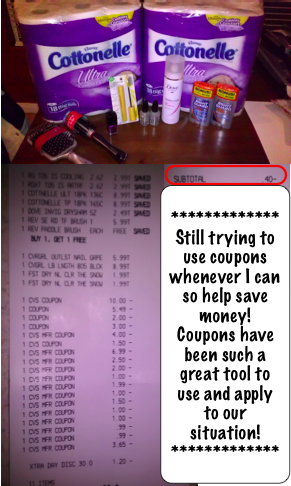 Using coupons is A LOT of work but for the most part there are people out there who write coupon blogs that pretty much tell you when something will be on sale and where to find the coupon for it, so that helps. This was my most recent shopping trip that I was able to use coupons for. Both manufacture and store coupons and in the end my subtotal was -$0.40! I ask all my family members for their coupons and I try to keep everything organized. I wish I lived in a place where we had a supermarket that doubled coupons or even tripled coupons. I haven't been able to coupon for actual food because it's not available where we live, but for now the soap, toilet paper, shampoo, conditioner, toothpaste etc. is a good start. Our Story Continues...Silence is hard. Winter One Day ONLY Special!! !